I spent a very significant portion of our Barenpark review complaining that it was too nice. Too collegiate. Too flexible. Too… accommodating. It’s a likeable game, but that’s largely because it doesn’t have a lot of bite. It doesn’t really ask a lot of anyone playing. I like games that have bite, especially if they’re about bears. 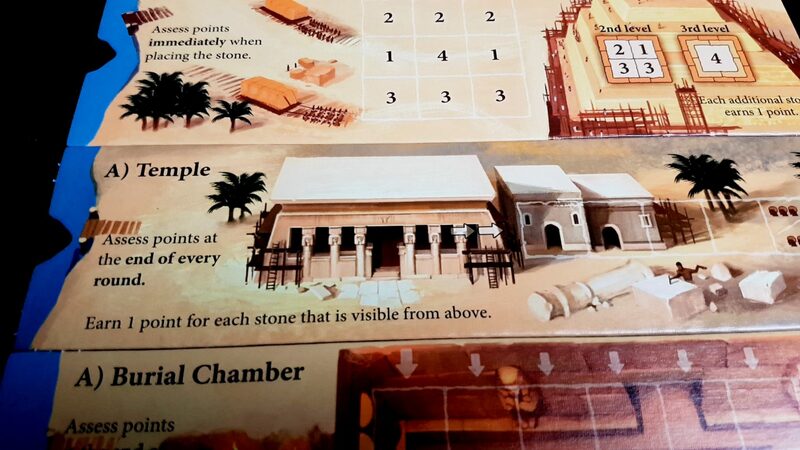 Turns out, there might be a reason that Barenpark is so devoid of any real adversarial tension – its designer probably used up all their reserves of that quality in the making of Imhotep. I sometimes have a problem starting reviews. It’s hard to strike the right tone – conversational and chatty but still relevant to what’s going to follow. Starting with a comparison to another game is easy, but that’s the problem – it’s too easy. It’s why people roll their eyes whenever a gaming journalist talks about ‘X is the Dark Souls of Y’ or the like. It’s rarely illuminating, and yet carries with it the pomposity of authority that marks it out as a pronouncement you’re supposed to find profound. Occasionally it’s revelatory, but those occasions are mostly limited to the genuinely insightful intersection of odd games in strange ways. Revelation is rarely an output of perfunctory and convenient analysis. Here’s my pompous pronouncement then. Imhotep is the sarcophagus in which the soul of Barenpark was interred. This is the game that I was wishing for when I complained in our Cottage Garden review about the direction of travel in polyomino placement. 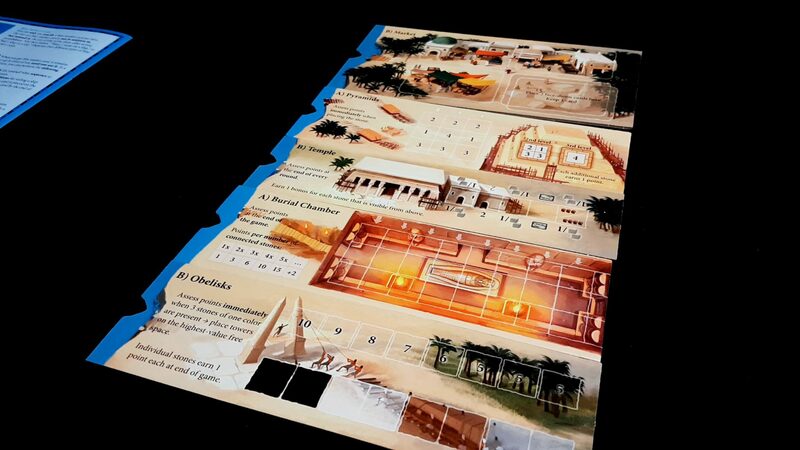 And yet there are no polyominoes in Imhotep. Where Barenpark frustrated me with the plastic inoffensiveness of its designs, Imhotep delights me with the tools it gives players for petty vindictiveness. It’s the most Tetris game I’ve ever played despite it having very little to do with the placement of awkwardly shaped pieces. Weird, right? I think so too. 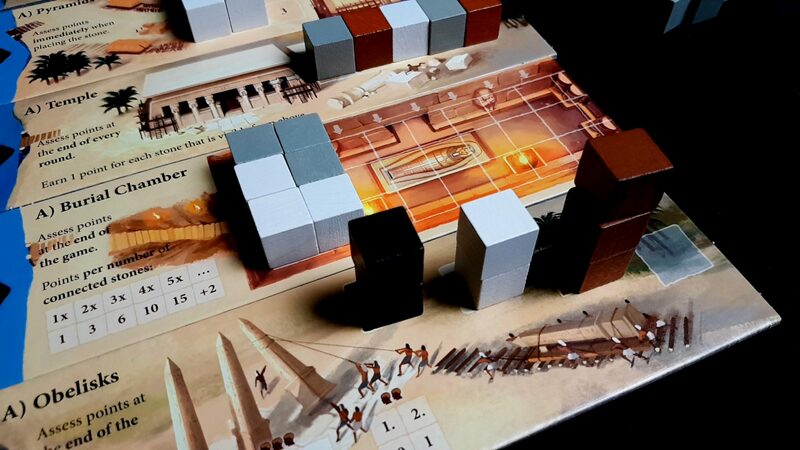 Within Imhotep we’re playing the parts of ancient Egyptian architects building the great monuments of antiquity. We’ve got the Pyramids, ready to be stacked up for the glory of the Pharaoh. We’ve got burial chambers for the venerable storage of the venerated dead. We’ve got obelisks, constructed in worship of the Gods, and we’ve got temples for the intonation of their rites. Or rather, we’re going to have them once we finally pull our fingers out and get to work. Sites of historical interest don’t build themselves. The flow of the game is remarkable for its simplicity. Each round, a series of ships are made available. Every player takes turns to decide what they want to do – grab some stones from the quarry, load a stone onto a boat, or sail a boat to a destination. Boats can only be sailed when they’ve been loaded up enough, and the destination determines what happens with their cargo. Stones destined for the market will buy special cards that confer bonuses or one-use powers. Every other destination is used for scoring. 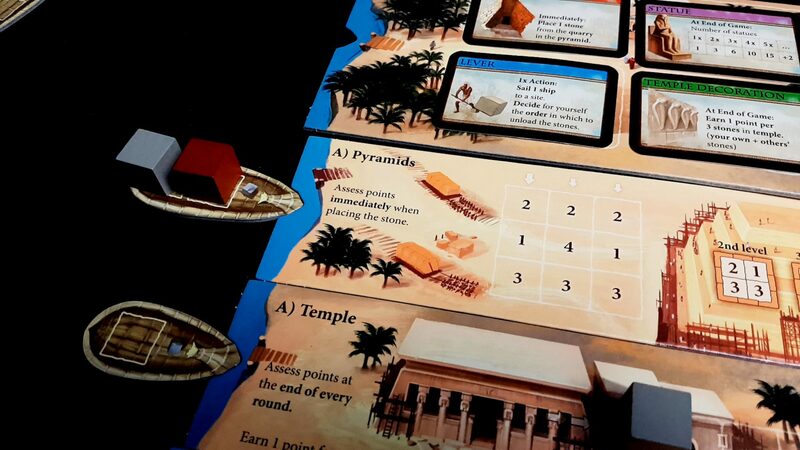 In its scoring though Imhotep doesn’t just flirt with the tactile joy of components. It straight up hauls it into bed and gives it the time of its life. 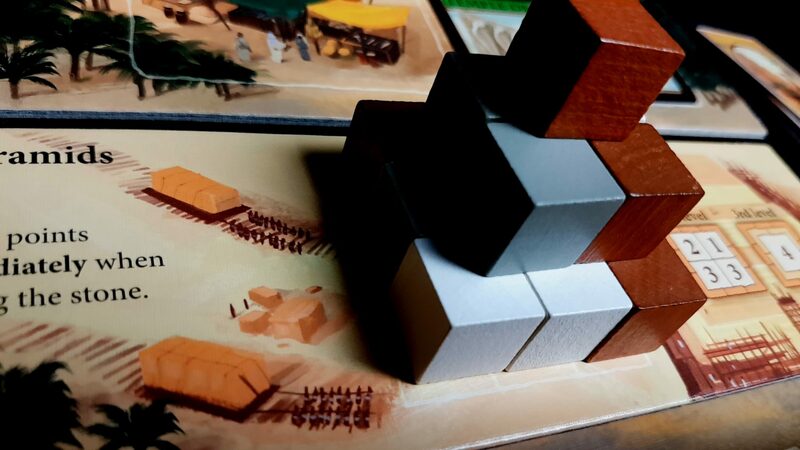 Imhotep is almost fetishistic in how much it wants you to simply enjoy playing with the large, heavy cubes that represent your quarried stone. It will happily open itself up to you, watching as you slot your cubes into position. It likes that a lot. Now we know. Oh, now we know. When a ship arrives at a destination the stones are offloaded in the order in which they were placed. FIFO, as we say in the computer science biz. Some special powers let you alter this a little, but only on a situational basis. When stones arrive at their location, you start arranging them on the open spaces. Each stone will earn its owner a certain number of points depending on where it’s placed. Not all stones are equal and this is going to be important as the game goes on. You can just visualise it, can’t you? The big, heavy stones you see in the featured image at the top of this post being offloaded into the construction of an actual pyramid. It feels just as nice to do this as you think – you can feel the erection building right underneath your eager fingers. Every block you place is going to be a point you score in your journey to be the greatest architect in Egypt. The way those stones work though will change from site to site. 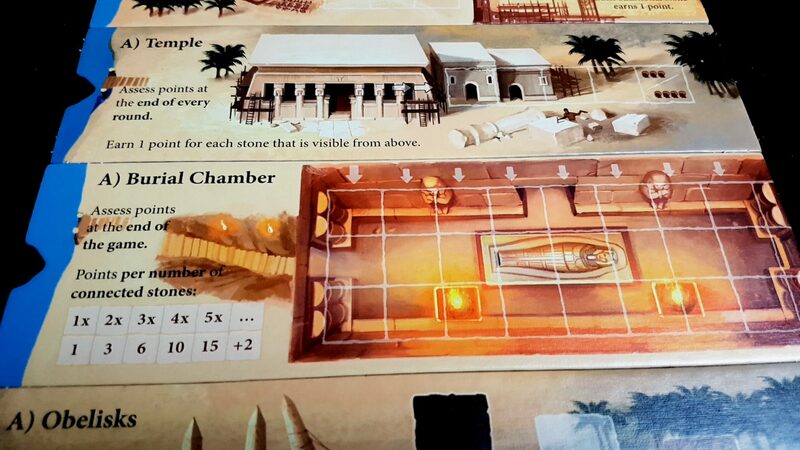 The burial chamber has a more sophisticated scoring system than blocks equal points – instead you are awarded points for contiguous patterns in the layout. Sheer tonnage of stone doesn’t matter here as much as the delicate placement of stone where it should go. A single block might be worth more than three as long as it’s going adjacent to other stones of your colour. When you’re loading up the ships you need to be doing that with an eye to where your cargo is going to end up. Your score for the burial chamber is determined only at the end of the game, and so you’ve got time to lever those blocks into place and really benefit from the intricate patterns of connection you construct. The temple on the other hand is scored at the end of every round based on what stones are actually visible from above. As you load and unload stones you and your colleagues will be trying to ensure that they don’t block their own stones while blocking those of their opponents. It’s like a tug of war where millions of tonnes of rock are being carelessly tossed up into a massive wall of passive aggression. I guess that’s not very much like a tug of war at all, now I think of it. And then finally there’s the obelisk – the player with the tallest obelisk will earn a massive chunk of points. Everyone else – well, they don’t go away empty handed but there’s a very sharp fall off from first place to second. The fewer players, the steeper the fall. Obelisk building is a risky game, but one with big rewards. You need to keep your eye on the prize, and that prize may be hundreds of metres up into the air. Each round continues until all the ships have been sailed to destinations, and once all the rounds are done with you total up the scores and you’re done. It takes longer to read a postcard from Cairo than it does to learn the rules of Imhotep. That’s perhaps one of the real genius elements here – there is nothing in Imhotep that doesn’t need to be there. Every single element of the game is immaculately designed to create the real tensions at the core of the experience. And my word, there is such tension. I’ve already mentioned where it comes from but you know – perhaps that’s not really enough in and of itself. Perhaps we need to GO DEEPER. 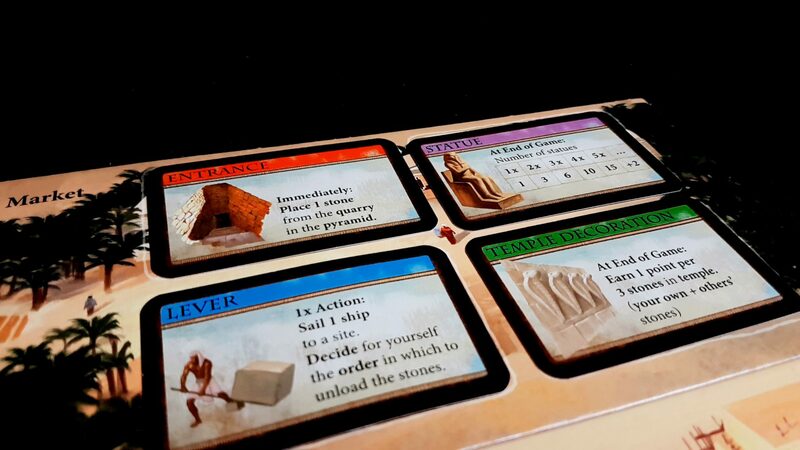 There are four actions you can take in your turn of Imhotep. You can collect some stones from the quarry to replace the ones that you’ve been merrily loading on to ships. That’s not where the tension is. If you have a special blue card, you can use its one-time power to temporarily suspend the normal rules of the game to your advantage. That’s not where the tension is. You can load a stone of yours onto the next available space on a boat. That’s also not where the tension is. The last action is that you can sail a ship to a destination. That is where the tension is because barring the use of special power cards you’re always doing this after another player has taken their turn. There are few opportunities to load a ship and then sail it. You load a ship, and then someone else gets to sail it to a destination. It’s such a simple mechanical system but it creates an absolutely glorious effect that everything else in Imhotep serves to enhance and refine. Every single turn you are either at the mercy of other players, or the one who must decide how merciful to be towards everyone else. Each ship has a minimum capacity that it must meet in order to be sailed, and each destination can be used only once per round. Aside from that, it’s no holds barred. You don’t even need to have any stones on a ship to sail it – you can just jump into the driver seat, shoving the current occupant into the Nile. ‘I’ll take it from here!’ you yell as you dump a consignment of stones where it does you the most good. Or perhaps more accurately, where it does your opponents the least good. It’s such a simple mechanical system but it makes you approach the loading of a ship like a zookeeper throwing raw meat into a lion’s cage. Sure, you can load up that ship with four of your cubes but it’s someone else that gets to decide where it goes. Maybe it goes to the obelisk you’re already dominating so as to keep you from making progress anywhere else. Maybe it goes to the temple to cover up the bricks you’ve already got exposed. Wherever it goes, it’s unlikely to be the place where your best interests reside. Not if anyone else has anything to say about it. It’s such a simple mechanical system and it creates the most wonderful push-your-luck element that I’ve seen in any game. The asynchronous nature of your plays means that you’re constantly deciding between sending a sub-optimal ship somewhere useful and someone else sending an optimal ship somewhere useless. Nobody is going to put a perfect ship where you want it to go so you need to be constantly a little too quick on the trigger to make sure that, at the very least, the gun is pointed in a helpful direction. And then there’s the other side of this – the embarrassment of riches that comes from taking a boat someone else has loaded up and sending it somewhere funny. The look on someone’s face when you take their stones and dump them off in the obelisk they already have locked up is fantastic, especially if you can in the process put someone else back into contention for the biggest prize. Maybe sometimes your role in proceedings is to make two other people less secure in their legacies. You will have many opportunities to do that too, because Imhotep has a series of encouragements at its core that mandate a delicate balance in your optimal placements. The key thing about Imhotep is that it demands you commit to your actions but also that you don’t overcommit. You only have a relatively small number of shipments you’ll be able to make and the point distributions discourage investing too deeply at once. One stone in the right place is better than four stones in the wrong places. A single stone in the centre of the pyramid will get you twice what you’d get from the two stones flanking it. You don’t get points for how much you win the obelisk. The temple ensures that you need to be careful about wasting effort by uselessly covering up your own stones. 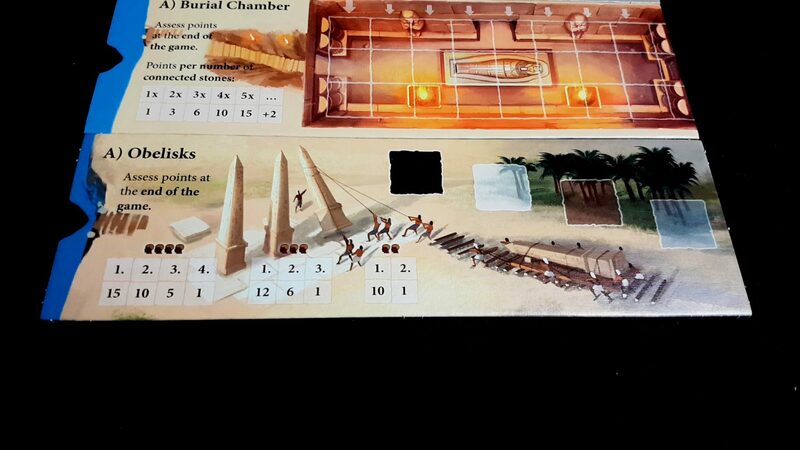 The burial chamber requires that you are surgically precise in your placements to get the most points. In all of these things it’s like performing an operation while an excited five-year-old is tugging on your scalpel arm. Every so often your hand is going to slip and do some unintentional damage. It’s such a simple mechanical system and it even creates such wonderful treasures in the marketplace. The special cards you can buy have only a few effects but they’re all powerful. Some give you points at the end of the game for every stone in a monument site. Imagine how that changes the risk and reward of the endeavour – those stones dumped on the obelisk are no longer the complete waste they were before. Some special cards will give you a set bonus that gets larger the more you collect. If people are neglecting those you might well find yourself in the lead because they are relatively easy to get and very lucrative in large numbers. And then there are the blue bordered special one-use cards. The lever lets you decide on the order in which stones are unloaded. Imagine having that available, and how it would impact on every decision every other player makes. The hammer lets you take stones and load one, giving you essentially two actions at once. The need to gather stone from a quarry is a powerful, ponderous depressant in your great works and this lets you do away with it at a key moment. The chisel lets you place two stones on a ship, or one stone on two different ships. That’s a great way to make sure that you get some benefit out of placement if you’re worried someone will send a ship away. But the most interesting of these cards is the sail card – it lets you place a stone on a ship and then immediately sail it to a site. It completely bypasses the usual push your luck element of play by giving you a risk-free opportunity to send an optimal ship where you actually want it to go. Don’t think everyone else is going to be unaware that’s a possibility. The mere presence of that option when it’s purchased from the market gives a powerful nudge to the push-your-luck element and sets it erratically rocking in random directions. It’s sometimes worth as much as a warning as it is a resource. And all this stems from such a simple mechanical system. The least satisfying reviews to write are the ones that don’t come with any meaningful criticism. I mean, let’s not pretend Imhotep isn’t going to end up getting a kicking in some parts of its teardown, but as a game it’s hard to fault. There’s nothing here that doesn’t need to be there. Everything it needs to have is present and correct. 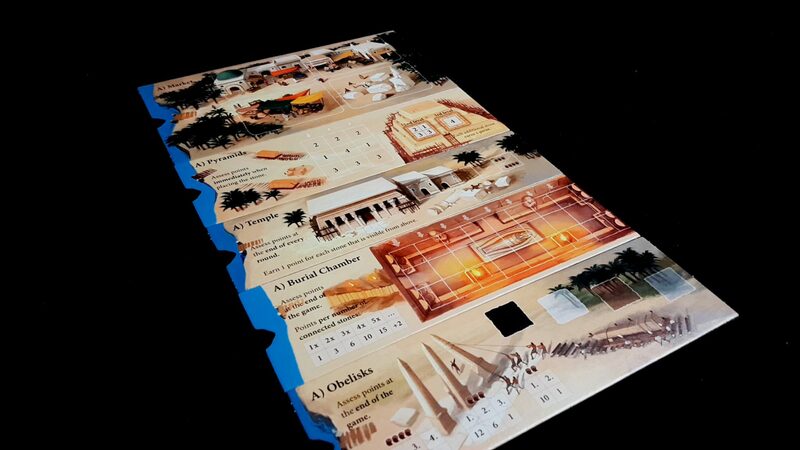 And yet it still offers variety by making the boards double sided, each with a different scoring system. You can mix and match, or play consistent sides, and you’ll get a different flavour to the game every single time. There’s nothing extraneous, and yet it still finds room to offer you choices. It is though, as you might have guessed, a game where the competition is pointed and extremely directed. That’s not a flaw in the play, but rather a consideration for its players and its presence here is exactly what I wanted to see in Barenpark and Cottage Garden. Most of what you spend your time doing in Imhotep is undoing the harm that you yourself facilitated – when you fall afoul of the timing you end up crushed underneath your own blocks. Just like in Tetris. 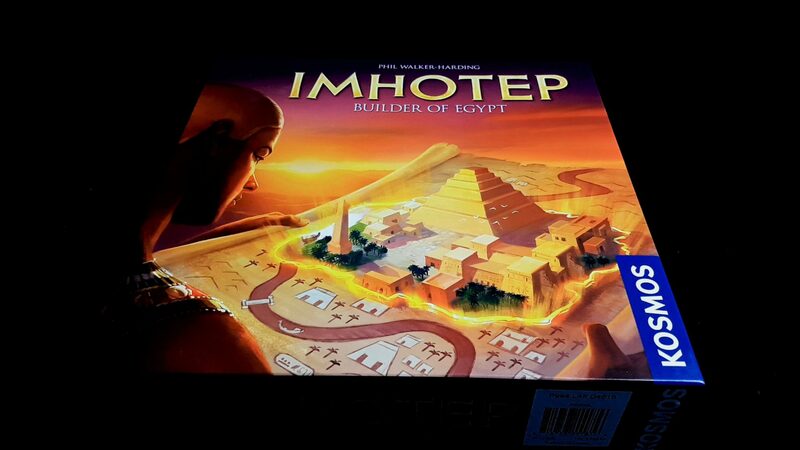 Imhotep is a fast paced, tense game of doing everything slightly earlier than you would like in circumstances that are far from ideal. Barenpark and Cottage Garden are both board game versions of Tetris, and they both fall short of truly capturing what makes that game so endlessly fascinating and absorbing. They make the mistake of thinking Tetris is about the polyominoes. Imhotep doesn’t make that mistake. 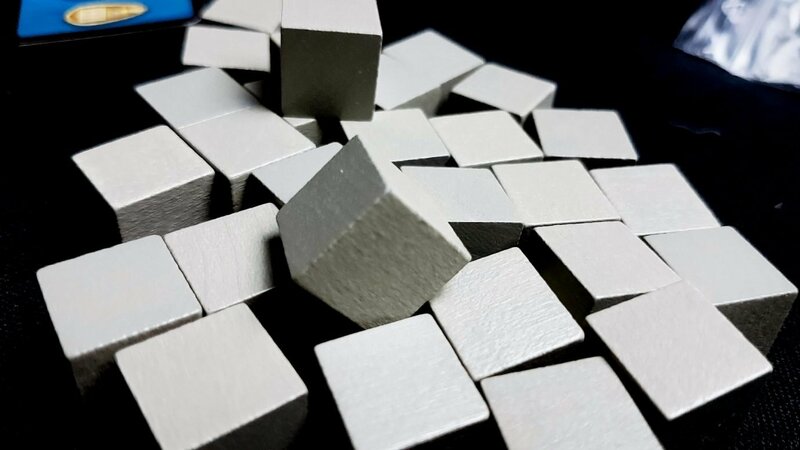 It understands that at its heart Tetris is a cruel practical joke – it pretends you have control over emerging chaos but forgets to point out that same control is focused through fallible human faculties. It knows that you are never more than a twitchy synapse away from failure. 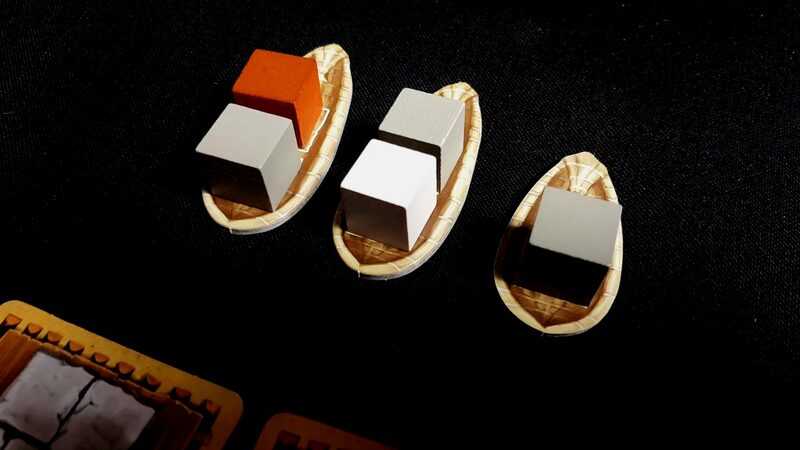 Imhotep flawlessly implements that with cardboard, cubes, and a handful of simple rules by giving the role of malevolent fate to your opponents. Imhotep is the best version of Tetris you can play in board-game format, and there isn’t even a single polyomino in sight.